things I would need to do is up my water intake. 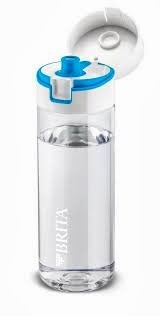 "Operation Drink More Water" by buying Brita's fill and go bottle. Since buying the bottle I've now been drinking an average of 2 litres a day. Since doing so I have felt so much more healthy and hydrated. I have also felt more energised this could also have to do with loosing a lot of weight though. as much fizzy drinks and squash as I used to. I will certainly sticking to choosing water from now on. is nothing worse then tepid water.